Published in the Lucy Mackenzie Humane Society newsletter and written by Dr. Brad Burrington. Though I was not around in 1915 when Lucy Mackenzie was founded, I have been around veterinary medicine for 30 years, and in that time, so much has changed. Technology has advanced, but so too, the status of pets in our society has changed. Pet owners preferences on how to use the technology has also changed. And, as more advanced technololgy and services are delivered to pets, the cost to provide all of this new advanced care is changing. A few examples follow to illustrate these changes, and to show how they impact the lives of pets who have been entrusted to the care of the team at Lucy Mackenzie Humane Society. In the “old days” some veterinarians would tell pet owners that a cat’s teeth might become diseased and the solution was to let the teeth rot away and fall out—seriously, that was once the extent of feline dental intervention. Somewhere along the way, veterinarians realized that pulling an occasional tooth from a cat’s mouth would take away a toothache. Today, all of the cats at Lucy Mackenzie routinely have their teeth assessed, and when indicated, the teeth are cleaned, polished, and any extractions are performed under general anesthesia with the benefit of nerve blocks. Anesthesia has changed. Years ago, most anesthesia for dog and cat surgery consisted of an injection of pentobarbital. Today, animals who need surgery or dental care have an anesthetic experience not unlike, in fact very much like, the experience humans have with anesthesia at Dartmouth. Sedatives and tranquilizers are given to take away any anxiety the pet might have. Next, an intravenous catheter is placed and intravenous fluids are given to maintain appropriate blood pressure. Anesthetic induction agents like ketamine or propofol are given, and then the patient is placed on a gas anesthesia machine just like those at Dartmouth. Cardiac monitors, respiratory monitors, blood pressure monitors, and oxygen saturation monitors, to name a few, are then attached to the patient. At Veremedy, every patient has a recovery nurse by their side until they are adequately awake. Diagnostic imaging is also an area where major changes have occurred. For all of my years as a veterinarian, x-ray pictures have assisted in making a diagnosis. In the beginning the pictures were developed in dark rooms using chemicals in stainless steel tanks; we were still in the dark, but the machine did most of the work. Today, we take digital x-ray pictures with computers. The images are available within seconds, and with the push of a button, the x-ray image can be uploaded to the internet where radiology specialists can give us insight into the diagnosis. At Veremedy, we routinely use diagnostic ultrasound to help diagnose a problem. Many of the sick animals at Lucy Mackenzie benefit from the ultrasound imaging. Even the ultrasound imaging has changed from grainy black and white images, to advanced computer generated pictures with colors that indicate blood flow. And let’s not forget CAT Scans and MRI technology, these, too, are used routinely now in veterinary medicine. Change happens! As helpful as all of this technology can be for our family pets, it is important to remember that the costs for providing this advanced care have also changed. It is not uncommon for veterinarians to spend $10,000 on their dental equipment, $15,000 on anesthesia equipment, and $50,000 or more for their digital x-ray equipment. Veremedy is proud and honored for the role we play in providing many of these advanced procedures to the patients at Lucy Mackenzie at much reduced prices. But for members of the general pet-owning public, sometimes the costs for advanced veterinary care can be challenging. 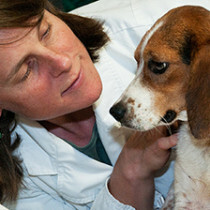 Thankfully, there have been advances in the ways that veterinary care can be financed as well. So, if your pet needs advanced medical procedures, and you need help making the payments for your pets care, make sure to ask your veterinarian about the latest advancements designed to assist pet owners with their pet’s health care bills. Though animal companionship with humans reaches back 15,000 years, there have been significant changes in how we view and treat animals in the last century. As technology increases our understanding of the brain function of animals, we have found that humans and our animal companions are more similar than we’d ever imagined. When treating medical needs of these companions, we should view them as such. Thank you! Very helpful for me writing a research paper. © 2019 Veremedy LLC. "Veremedy" is a registered Trademark of Veremedy, LLC.